"Perseverance shall win the reward." We all know that success is almost never without failure at some part of the process. Often failures arrive at the start of building something new. To not let one's self be discouraged is paramount to arriving at a successful end of any new venture or enterprise. The story of Thomas Edison's quest for a new type of lighting device is one of the great stories of perseverance and one that all of us would do well to remember during those times when it looks like we might never get it right. It is also the story of a small thing that changed the course of mankind and helped usher in the modern world. In the period from 1878 to 1880 Edison and his associates worked on at least three thousand different theories to develop an efficient incandescent lamp. 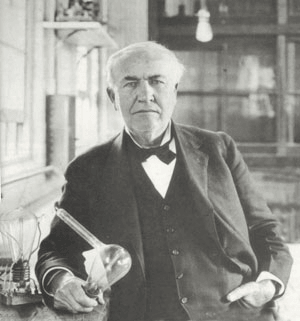 Edison’s lamp would consist of a filament housed in a glass vacuum bulb. He had his own glass blowing shed where the fragile bulbs were carefully crafted for his experiments. Edison was trying to come up with a high resistance system that would require far less electrical power than was used for the arc lamps. This could eventually mean small electric lights suitable for home use. By January 1879, at his laboratory in Menlo Park, New Jersey, Edison had built his first high resistance, incandescent electric light. It worked by passing electricity through a thin platinum filament in the glass vacuum bulb, which delayed the filament from melting. Still, the lamp only burned for a few short hours. In order to improve the bulb, Edison needed all the persistence he had learned years before in his basement laboratory. He tested thousands and thousands of other materials to use for the filament. He even thought about using tungsten, which is the metal used for light bulb filaments now, but he couldn't work with it given the tools available at that time. He tested the carbonized filaments of every plant imaginable, including bay wood, boxwood, hickory, cedar, flax, and bamboo. He even contacted biologists who sent him plant fibers from places in the tropics. Edison acknowledged that the work was tedious and very demanding, especially on his workers helping with the experiments. He always recognized the importance of hard work and determination. "Before I got through," he recalled, "I tested no fewer than 6,000 vegetable growths, and ransacked the world for the most suitable filament material." When asked about his accomplishment Edison commented, "The electric light has caused me the greatest amount of study and has required the most elaborate experiments," he wrote. "I was never myself discouraged, or inclined to be hopeless of success. I cannot say the same for all my associates. ""Genius is one percent inspiration and ninety-nine percent perspiration." Edison decided to try a carbonized cotton thread filament. When voltage was applied to the completed bulb, it began to radiate a soft orange glow. Just about fifteen hours later, the filament finally burned out. Further experimentation produced filaments that could burn longer and longer with each test. 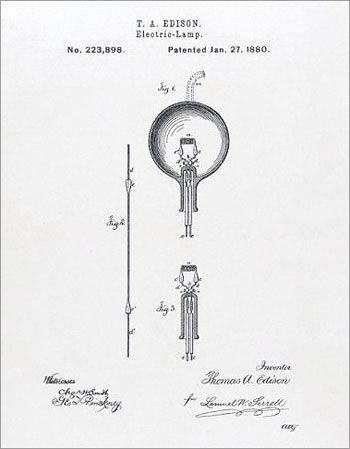 By the end of 1880, he had produced a 16-watt bulb that could last for 1500 hours and he began to market his new invention. 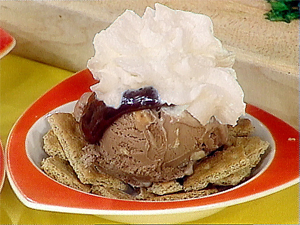 Place crushed grahams in the bottom of dessert bowls or sundae dishes. Top with rocky road ice cream, 1 big scoops. Heat hot fudge in microwave and pour over ice cream. Top with whipped cream, nuts and a cherry.